On July 30, mainstream media reported widely that a young teenager was referred to UK government anti-extremism program 'Prevent', due to concerns he was "groomed" for environmental activism by anti-fracking campaigners. The story has since been admitted to be false - and campaigners say it’s a palpable example of authorities criminalizing dissent. The story was based on a case study included in a report published by Greater Manchester Police's ‘Tackling Hateful Extremism and Promoting Social Cohesion Commission', launched in the wake of the May 2017 Manchester Arena bombing attack. It is one of several examples cited in the 124-page document, based on the apparent experiences of counter-terrorism police in North West England. ‘Aaron' is described as a 14-year-old "A star pupil", with a number of "underlying vulnerabilities", including potentially undiagnosed Autistic Spectrum Disorder — he was also said to be "socially isolated and prone to self-harm". He was, the report claimed, referred to ‘Channel' — an individualized, multi-agency support package provided to schools under the auspices of the highly controversial ‘Prevent' program — due to concerns about his "extreme beliefs" on environmental issues. 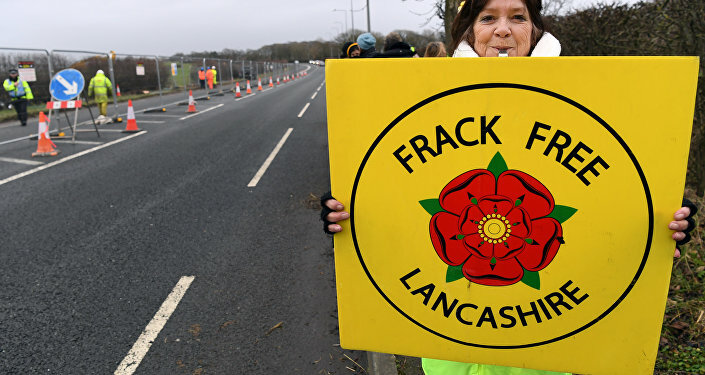 The study alleged he was targeted via social media by an anti-fracking campaign group after signing an online petition — the activists encouraged him to participate in local events, and hand out leaflets. "These approaches became progressively more aggressive to the point Aaron was on the periphery of engaging in criminal behaviour and frequently reported to the police as missing by his parents," the report stated. Over time, the boy's school attendance was said to have become increasingly poor as his visits to rallies and engagement with activists increased — and it was only due to parental monitoring of his social media activity his involvement in "potential adverse criminal incidents" was averted. However, these interventions led ‘Aaron' to begin interacting with activists via the ‘dark web', meaning his parents and authorities alike struggled to "effectively disrupt" his activism and protect him from harm. "A decision was made to issue an abduction notice to the main protagonist of the social media lobbying. Within two hours of the notice being issued, Aaron was ‘de-friended' on social media by all individuals who'd encouraged his activist behaviour. A few months later, Aaron is more settled at school, attendance has improved and he's engaging with appropriate peers," the report alleged. The case study goes on to boast about the "wealth of disruption tactics" at the disposal of authorities — and suggests lessons learned from other "crime types", such as child sexual exploitation, "should be translated into other arenas". The report prompted condemnation from many readers — but while their ire was overwhelmingly directed at authorities for referring a young, vulnerable adolescent to the Prevent program, Network for Police Monitoring coordinator Kevin Blowe was outraged on every conceivable level. "For one, I was shocked at the unquestioning reporting — yes, some did at least mention how disgusted campaigners were by the case study, but it was all cut and paste jobs, transmitting unsupported allegations as fact. Journalists uncritically relaying official statements is a huge issue — 13 years after he was killed, I still meet people who believe Jean Charles de Menezes jumped the barriers at Stockwell station, purely because it was all over news at the time," Kevin told Sputnik. The civil liberties campaigner's grievances would be greatly amplified mere hours later, when Greater Manchester Police revealed ‘Aaron's' story was untrue. A spokesperson claimed while the case study was based on a real-life incident, key details had been altered to protect the young individual's identity, including the nature of the group that targeted the boy — although this amendment was said to be a "dreadful" mistake. "A factual detail was altered which shouldn't have been. The study mistakenly said concerns were raised around fracking. They were actually raised around a form of environmental extremism. Although this change was made with the good intention of protecting the individual's identity, ultimately it was the wrong thing to do. We apologise for this error," Commission Chair Rishi Shori added. However, for Kevin, the Commission's clarification simply raises further, even more serious questions. For example, he notes opposition to fracking falls far outside the report's own definition of what constitutes ‘hateful extremism' — "ideas and behaviors hateful towards specific ‘others' and designed to undermine social cohesion". "Given that, why was anti-fracking considered a substitute for a form of ‘environmental extremism' by the report's authors? What do they even mean by ‘environmental extremism'? I strongly suspect the movement was invoked as it's on the police's radar and a key area of concern — but why is it a concern in the first place? Anti-fracking activists are overwhelmingly retired, female, first-time protesters living in rural communities. Painting them as cynical exploiters of children using tactics employed by pedophiles is surely a deliberate attempt to discredit them and deter more people getting involved," Kevin told Sputnik. Moreover, in advocating "learning from other crime types" to deal with cases such as ‘Aaron', the report clearly characterises what allegedly happened to the boy as criminal activity — yet at no point does the case study indicate any crime was ever committed. For instance, absence from school — while undoubtedly of high concern to the alleged boy's apparent parents — in order to participate in political activism is not a police matter, let alone a counter-terrorism police matter. For Kevin, this begs the question of why authorities were notified of the case at all, and whether their use of an abduction order to intimidate campaigners into cutting off contact with ‘Aaron' can possibly be justified — if indeed it happened at all. In a sense, the criminalization of peaceful anti-fracking activists in official literature shouldn't surprise — it's certainly not without practical precedent. The ever-increasingly heavy-handed tactics of police officers at non-violent fracking demonstrations has been extensively chronicled in recent years, with powers of arrest exercised liberally, arbitrarily and often unlawfully. There are documented examples of protesters being taken into custody on incomprehensible charges such as ‘walking with intent', and the forcible removal of a 79-year-old from a protest for distributing tea to attendees. "The police have adopted a zero-tolerance approach to anti-fracking protests on the alleged basis they're ‘disruptive', and therefore somehow violent — which is ludicrous, given virtually any protest is going to disrupt something or other. A march through central London is going to obstruct and impede the work of taxi drivers and delivery riders, say, even if it's totally peaceful," Kevin told Sputnik. Moreover, it's been known since 2014 anti-fracking protesters have been classified as ‘domestic extremists' by authorities, under the Prevent strategy. The program was launched in 2011 by then-Home Secretary Theresa May, and avowedly aimed to counter both "violent and non-violent extremism", protect "vulnerable" individuals at risk of becoming extremists, and defend "British values". As Netpol has long-documented, political activists of almost every stripe in Britain has been deemed ‘domestic extremists' under Prevent — and any movement that attracts the label is subject to ‘risk' and ‘threat' assessments by police, with detailed profiles of groups' key figures, organizational structures and tactics compiled via concerted surveillance. Ironically, authorities have struggled to devise a definition of the term ‘domestic extremist' capable of withstanding legal scrutiny, although the Metropolitan Police produced a 'working definition' in 2014 — "groups or individuals who commit or plan serious criminal activity motivated by a political or ideological viewpoint". The Home Office has nonetheless since conceded many groups subject to the label pose no risk to the public, with their activities unlikely to become criminal, let alone terroristic. Anti-frackers are but one example of this iniquitous contradiction — in correspondence with the Home Office in 2017, a spokesperson told an Observer journalist that while Prevent "[safeguards] people at risk from being drawn into terrorism," support for anti-fracking "is not an indicator of vulnerability". Despite this, declassified internal police files reveal official interest in anti-fracking campaigners is so intense they've been subject to clandestine surveillance. In 2013, 126 activists were arrested over the course of 62 days at a mass ‘climate camp' protest in Balcombe, Sussex. The next year, an internal police review of the operation was conducted — released following freedom of information requests, its contents indicated an "appropriate range of intelligence sources" were used to surveil protesters, including "covert means". The form this cloak-and-dagger monitoring took has never been confirmed, but it may have involved penetration of the group by undercover officers, in the manner of the infamous ‘spycops' who've spied on political groups in the UK since 1968. 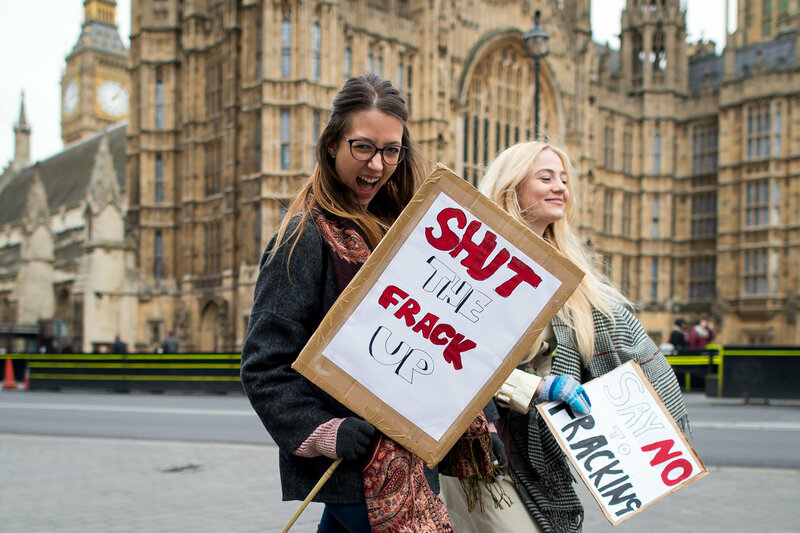 Activists attend an anti-fracking rally outside the Houses of Parliament in central London on January 26, 2015, calling for MPs to vote for a moratorium on fracking within the UK. Still, whatever the truth of the matter, Kevin thinks what makes authorities' harsh conduct towards and smearing of anti-frackers all the more perverse is it's driven by the interests — and presumably demands — of private industry. "This ‘Aaron' farce perfectly embodies everything that's wrong with Prevent — using the meaningless, police-invented label of ‘domestic extremism' to discredit and criminalize dissent, responding in a totally draconian, disproportionate manner to the non-existent ‘threat' of legitimate protest activities, and counter-terrorism officers getting involved in all manner of areas that don't concern them in any way. This has to stop right now," Kevin concludes.